This solid timber bedroom suite is made from New Zealand pine. 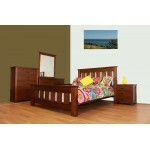 it comes wit..
Do you have large room that you want to put a solid timber bed? Well the be.. 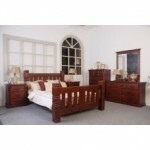 This Tasmanian Oak suite features solid Tasmanian Oak, Maxi lock brackets, ..